Background: The Georgia Advance Manufacturing Center is a 48,000 SF Quick Start Training Facility was established to train, attract, and retain manufacturing workers in the state of Georgia. 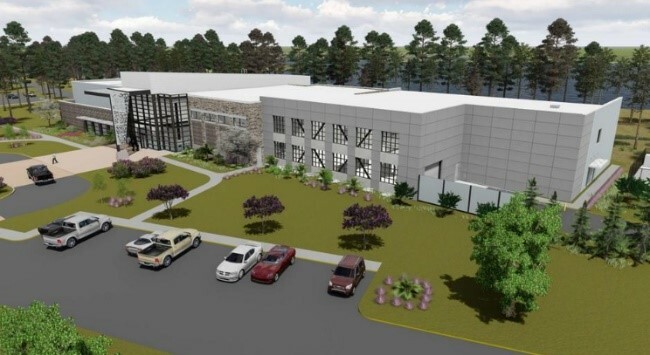 The facility will include the space and equipment to deliver customized training in all core and emerging technologies in advanced manufacturing, including welding, mechatronics, control systems, automation and robots, industrial technologies and networked wireless systems of sensors, software, equipment and operation controls. Quick Start is one of Georgia’s internationally acclaimed program providing customized training free-of-charge to qualified new, expanding and existing businesses. For this project, Raymond Engineering served as the Structural Engineer of Record, and provided structural design services and construction administration services. The project consisted of a steel framed building with a large high bay area for training on one side of the building and a large conference area on the other. Located between these two areas is administration spaces, including offices, a lobby, restrooms, and classrooms. The single-story areas are bar joists supported by steel beams and shallow foundations, while the 2-story area is bar joists supported by steel beams and then a composite second floor with composite beams and supported by shallow foundations.